How Reliable is the Bureau’s Heatwave Service? “Heatwaves are calculated using the forecast maximum and minimum temperatures over the next three days, comparing this to actual temperatures over the previous thirty days, and then comparing these same three days to the ‘normal’ temperatures expected for that particular location. Using this calculation takes into account people’s ability to adapt to the heat. For example, the same high temperature will be felt differently by residents in Perth compared to those in Hobart, who are not used to the higher range of temperatures experienced in Perth. This means that in any one location, temperatures that meet the criteria for a heatwave at the end of summer will generally be hotter, than the temperatures that meet the criteria for a heatwave at the beginning of summer. Back in 2015 I showed how this algorithm works perfectly for Melbourne, but fails to detect heatwaves in Marble Bar and instead finds heatwaves at Mawson in the Antarctic. In light of the long period of very hot weather across most of western Queensland, what does the Heatwave Service show? Here is their assessment of conditions in Queensland over the last three days…. Most of inland Queensland has been in a “Low-Intensity Heatwave”, with a couple of small areas near the southern border of “Severe Heatwave”. And here is their forecast for the next three days..
Much the same, with a bit more Severe Heatwave coming. About half the state was above 39 degrees C, a large area was above 42C, and there were smaller areas of above 45C. 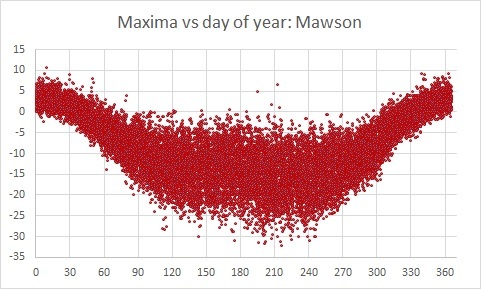 Average maxima for roughly the same areas were the same, except there was a larger area averaging over 45C! This follows December when a large slab of the state averaged from 39C to 42C for the month. Apart from the 6th, when it was a cool 38.8C, since Christmas Eve the temperature has been above 40C every day, and is forecast to stay above 40C until next Tuesday (and above 45C until Sunday). Minima have been above 25C on all but three days since Christmas. The Bureau’s unspoken message? It might be a bit hot, but you’re supposed to be used to it. Harden up! Western Queensland residents are pretty tough, but surely a month of such heat deserves a higher level of description than “Low Intensity”- especially for the vulnerable like babies, old people, and visitors. This is worse than laughable. The Bureau’s heatwave service is a crock. 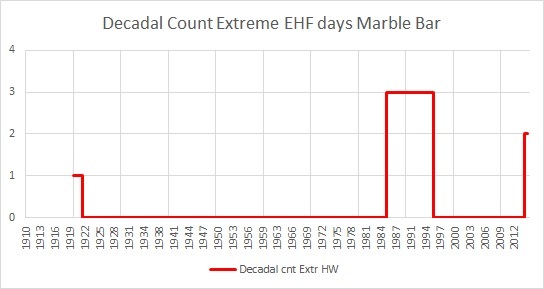 As I said in my 2015 post, a methodology that fails to detect heatwaves at Marble Bar (or Birdsville! ), and creates them in Antarctica, is worse than useless- it is dangerous. TC Debbie hit the Whitsunday coast and areas to the south and inland yesterday. As I spent nearly half my life in places not far from Mackay and have many friends in the region, I was very interested to see what was happening. I began checking online from 5 a.m. Tuesday morning. Here is some initial analysis of TC Debbie. Firstly, here is the table of cyclone intensities as found at http://www.bom.gov.au/cyclone/faq/index.shtml#definitions . I began checking online from 5 a.m. Tuesday morning. Fig. 2: 0500 forecast cyclone track map. How accurate was the Bureau’s forecast? Here is the forecast 22 hours later, at 0300 Wednesday morning. Fig. 3: Wednesday 0300 forecast cyclone track map. The track forecast was pretty good. The next images show Debbie’s progress across the Whitsunday Islands until the eyewall crossed the coast near Airlie Beach. 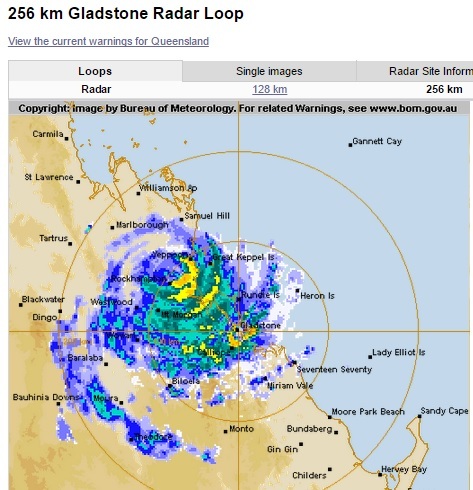 And four and a half hours later, the worst is over at Hamilton and Hayman Island and the eye is collapsing over Proserpine. Note the “gap” in the image in the northwest sector. 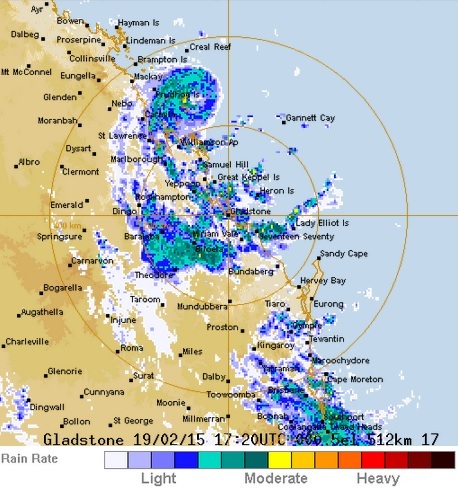 The Bowen radar failed and the Mackay radar was blocked by high mountains to the west. What about forecasts of the cyclone’s intensity? The next figures show plots of wind gusts, pressure, temperature, and rain at Hamilton Island, Proserpine, and Bowen, the closest stations to the cyclone’s track. The black line shows the period from just before 8.00 a.m. until about 2.30 p.m. during which Hamilton Island was close to the eyewall, the area of maximum wind strength. For nine hours from before 6.00 a.m. until nearly 3.00 p.m. wind gusts were of Category 3 strength. From 8.00 a.m. until 12.30 p.m. gusts approached or exceeded 225 km/hr, bordering on category 4, and between 10.35 and 10.30 reached 263 km/hr three times at least- and the Bureau had forecast winds up to 270 km/hr. While the station at Hamilton Island is too high to be completely reliable, these data are indicative that winds at 10 metres were at cat 4 level for some time. The red line shows the period from just before 8.00 a.m. until about 2.30 p.m. during which Hamilton Island was near the eyewall, the area of maximum wind strength. From 2.00 a.m. until 5.00 p.m. pressure was below 985 hPa (Cat, 2) and from 10.00 a.m. until 1.30 p.m. was below 970 hPa (Cat.3) but did not reach 955 hPa (Cat. 4). Remember however that Hamilton Island was some 50 km from the centre of the eye, so 955 hPa is quite possible for central pressure. On the basis of wind gusts and pressure at Hamilton Island, I believe Debbie was a strong Category 3, weak Category 4 system. Note the sudden jump in temperature from 8.12 a.m.- 3 degrees in 3 minutes- coinciding with a wind gust of 212 km/hr, and kept climbing to unbelievable values. (Compare with Proserpine below.) It is likely that the AWS probe malfunctioned, and failed altogether at 12.00 noon. Rain measurement is unlikely to be accurate in such ferocious winds. Note how rainfall levelled off from 11.00 a.m until 2.00 p.m., then increased after 3.00 p.m.
Proserpine Airport is some 20 km inland, 41 km west of Hamilton Island and 56 km from Bowen. As the cyclone arrived over land it began losing strength and the eye began to shrink. From 10.00 a.m. until 2.00 p.m. gusts were at Category 2 strength and at 1.00 p.m. reached the magic 165 km/hr of Cat 3 strength. They were very probably much stronger in the town itself 9.1 km north. From 12.30 p.m. until 5.00 p.m. the pressure at the airport, some 20-30 km from the centre, was below the Category 3 value of 970 hPa. Wind gust and pressure data indicate Debbie was very likely still Category 3 as it passed over Proserpine town. Fairly stable temperature with only about 1.5C range all day. Steady rain all day, fairly typical of cyclonic conditions. At Strathdickie not far from Proserpine, 193mm fell in one hour that morning, and at Dalrymple Heights about 50km south 814mm fell in 24 hours. For four and a half hours wind gusts reached Category 2 strength, and were above 100 km/hr from 9.00 a.m. to 8.00 p.m.
Pressure was at Category 2 levels from 9.00 a.m. Winds were west south west most of the day, but as Debbie passed and winds turned northwest (over the ocean), the temperature climbed. Steady rain all day: 12 inches in 12 hours. While no stations were directly in the cyclone’s path, nearby station data indicate that Debbie was a large Category 3 to Category 4 tropical cyclone when it hit the coast and brought very strong winds, very heavy rainfall, and widespread destruction. It is still lingering as a tropical low 300 km inland, bringing more strong winds and very heavy rain, and will head south over the next couple of days. The clean up begins. We await the report from James Cook University engineers who will provide their assessment of damage and wind loadings in a few weeks’ time. Give credit where credit is due: the Bureau of Meteorology got this one pretty right. When Is A Heatwave Not A Heatwave? When the Bureau of Meteorology defines it out of existence. 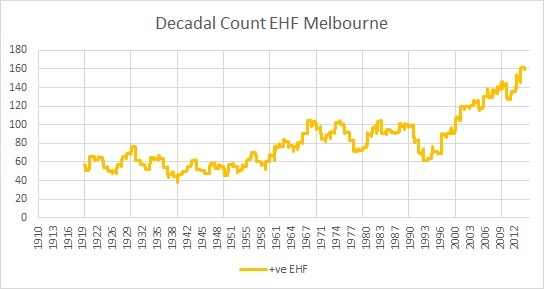 The method is quite easy to follow and implement, and I was able to replicate results for the 2014 Melbourne heatwave exactly and use it successfully for other single locations. It is designed for use with AWAP gridded data of course to give forecast maps. Note this is raw data, not homogenised. I downloaded all data from Climate Data Online. There are several steps. Readers should read the paper for full details. Briefly, using a daily mean temperature calculated by averaging the day’s maximum and the following night’s minimum, three-day means are calculated. These are then compared by subtracting the previous 30 days’ daily means (as people acclimatise to changed temperatures in this period). 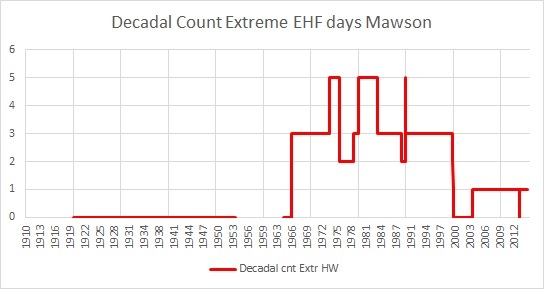 Differences that exceed the 95th percentile of all three-day means from 1971 to 2000 are multiplied by the three-day mean to give the Excess Heat Factor, which indicates heatwave. 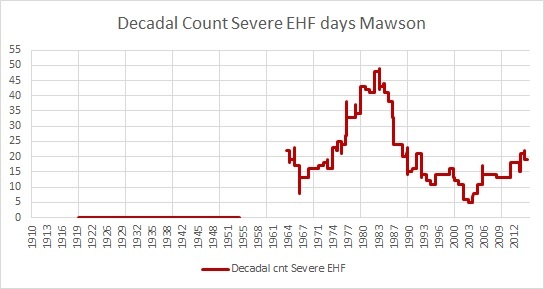 This is then compared with the 85th percentile of all positive EHFs from 1958 to 2011 to give a severity index, and if it exceeds 3 times the 85th percentile this becomes an extreme heatwave event. Here are the results for Melbourne- with all its UHI effect of course. 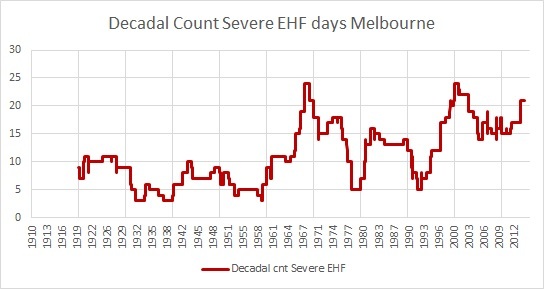 Notice how Melbourne heatwaves of all types have been increasing and extreme events are currently at the highest level “ever”. How does this apply to various other Australian locations? I decided to check with the extremes- the hottest and the coldest Australian locations, Marble Bar in the north west of W.A. and Mawson Base in Australia’s Antarctic Territory. The old Marble Bar station closed in 2006. 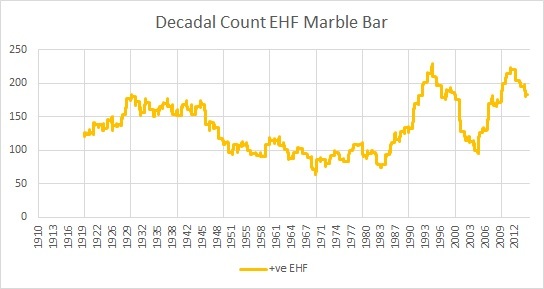 I have concatenated the old Marble Bar data with the new, from 2003. This makes very little difference to the calculations but extends the record to the present. It is clear that local climate does make a big difference to heatwaves by this definition. 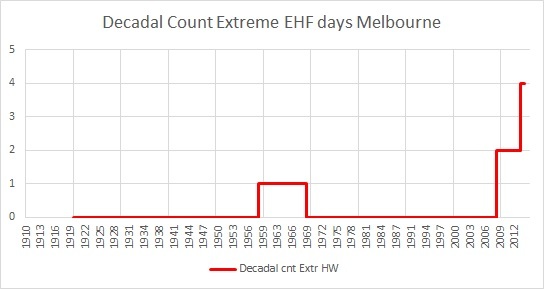 In fact, Melbourne has more extreme heatwave days than Marble Bar! 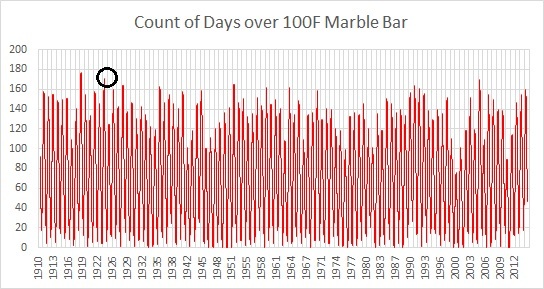 How does this method of detecting and measuring heatwaves deal with Marble Bar’s record heatwave of 1923-24? I count 158 days consecutively from daily data at Climate Data Online. The total for the 1923-24 summer from 13 October to 19 April was 174 days. That is indeed a long period of very hot weather. Surprisingly, the BOM does not class that as a long or extreme heatwave. 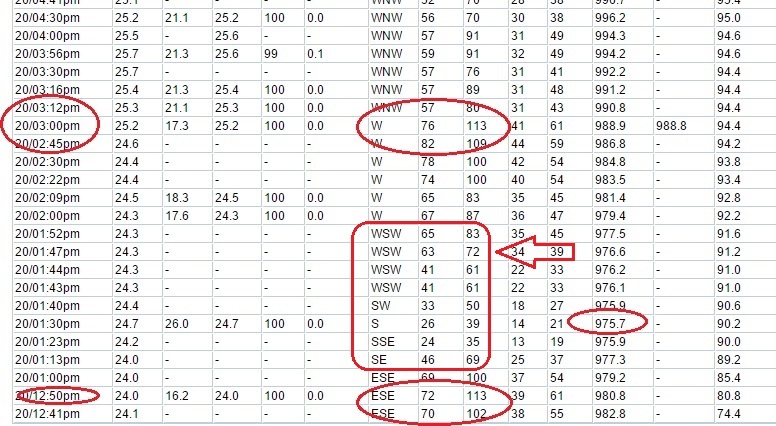 Apparently, according to this metric, there were only four short heatwaves, one of them severe, and none extreme. For the entire period, there was only one severe heatwave day – 3 February. Fig. 8: Marble Bar 1923-24 summer. I have marked in the old “ton”, 100 F, or 37.8C. Squint hard to see the “severe’ heatwave around 3 February, but the heatwave around 22 February is invisible to the naked eye. Yes, the old timers at Marble Bar were pretty tough and would be used to hot conditions. But not to recognise this old record heatwave when every day in over five months was considerably above body temperature is laughable. Fig. 9: Running 182 day counts of days over 100 F. 1923-24 is circled. Note there were two other years when there were more than 170 days over 100F. Figure 10 is from Figure 16 in the Nairn and Fawcett paper, and is a map of the level of Excess Heat Factor across Australia during the heatwave of January-February 2009. Fig. 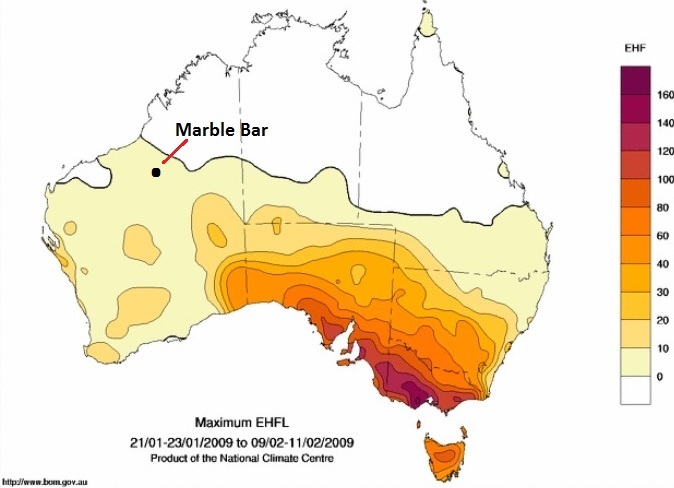 10: Figure 16 from Nairn and Fawcett (2014)- Excess Heat levels across Australia 21 January – 11 February 2009. 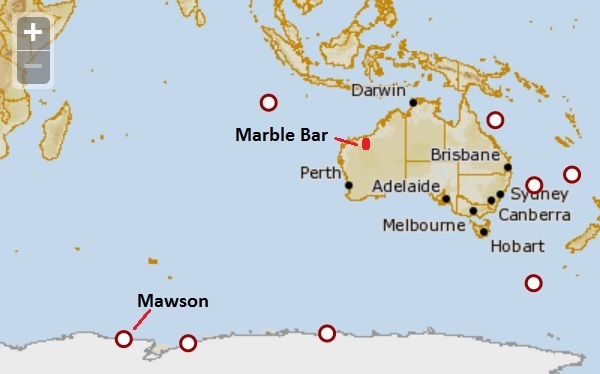 The area around Marble Bar has a level of between 0 and 10. 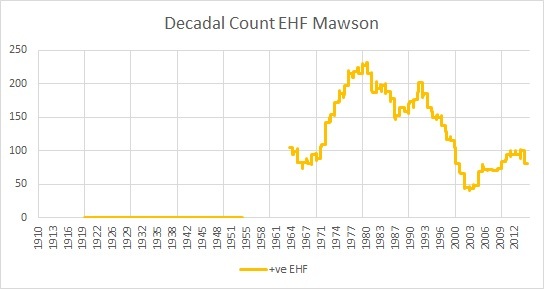 My calculations show this is correct- EHF reached 0.08 on 23 January- a mild heatwave. Readers may be interested to know that maximum temperature was above 40 degrees Celsius from 1 January to 24 January, and minima were not below 24.3. The authors, and their employer, the Bureau, are in effect telling Marble Bar locals their heatwaves don’t rate because they’re used to the heat. Now I shall turn to the other extreme- Mawson. Apparently, Antarctica gets more extreme heatwave days than Melbourne, or Marble Bar! 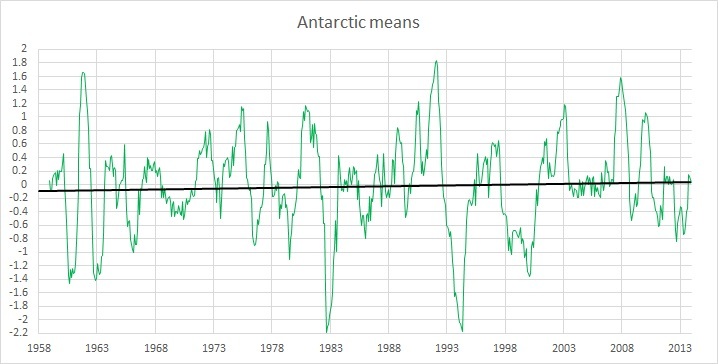 Of course, critics will say this metric was never intended for use in Antarctica, and I agree: no one would seriously claim there are heatwaves there. However, if heatwaves are to be defined as “a period of at least three days where the combined effect of high temperatures and excess heat is unusual within the local climate”, and NOT by comparison with any absolute threshold, then this analysis of its use there is valid. “High” temperature by this definition is relative to the local climate, wherever “local” is. If this metric fails in Antarctica, it fails everywhere. The Bureau of Meteorology’s metric for heatwaves is a joke. It may accurately detect heatwaves in the southern fringe of Australia, and a further use may be to support Dr Vertessy’s outlandish claims. However, it fails to cope with different climates, particularly extremes. 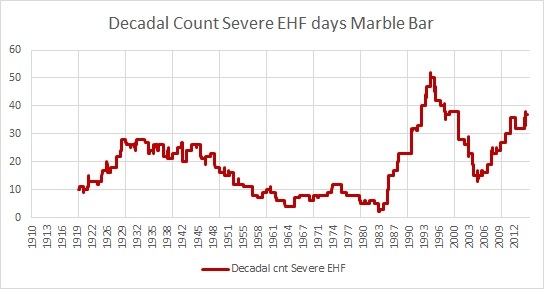 A methodology that fails to detect heatwaves at Marble Bar, and creates them in Antarctica, is worse than useless- it is dangerous. 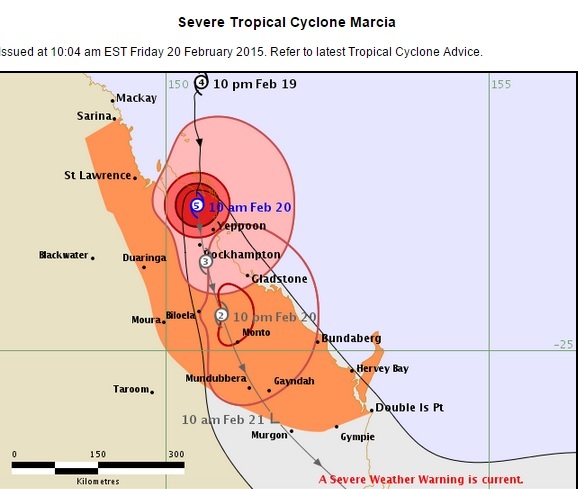 A week after the event, now that our power has been restored, internet seems back to normal, and our cleanup is mostly complete, I can turn to an analysis of Tropical Cyclone Marcia. Much initial analysis has been done, especially by Jen Marohasy at http://jennifermarohasy.com/jenns-blog/ who was in contact with me soon after the cyclone, and also by the Cyclone Testing Station of James Cook University. However, perhaps I can add to the discussion with some additional suggestions and some personal observations. I was there. The eye passed over our house for about 25 to 30 minutes. I have felt the impact in Rockhampton, experienced the electricity supply loss for 6 days and 6 hours, and cleaned up tree damage to our own 1.5 acre block, the local Heritage Village and a nursing home where a family member is resident. Close family members were also without power. I can also relate the experience to previous cyclones when I lived in the Mackay area. Tropical Cyclone Marcia was a very small, intense, and short lived Complex Cyclone, with maximum winds about 30 – 40 km away from the centre, and well outside the eye wall. At all times the Bureau of Meteorology was reporting its strength as at least one Category (more likely two) above what ground observations showed. There is no surface evidence to show it was ever Category 5. The only surface observation available indicates Category 3. 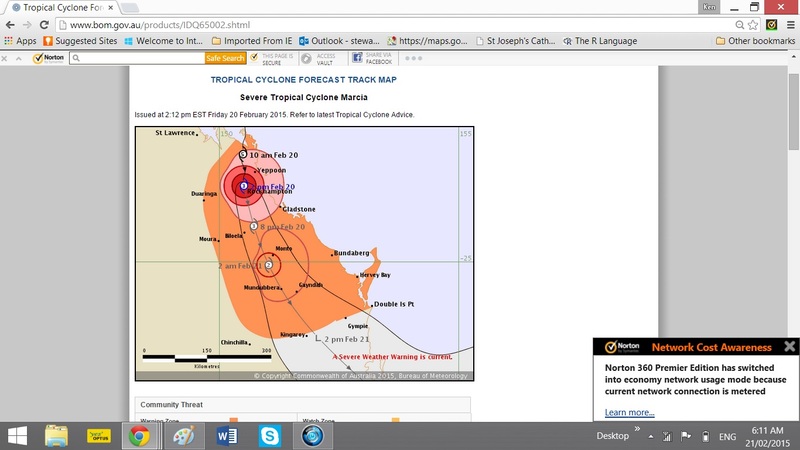 I watched on various websites the approach of TC Marcia throughout the day on Thursday 19th, and every couple of hours that night (few people got much sleep), and for as long as I had landline and then mobile internet connection (and power in my laptop) on Friday 20th. Marcia rapidly intensified during Thursday. 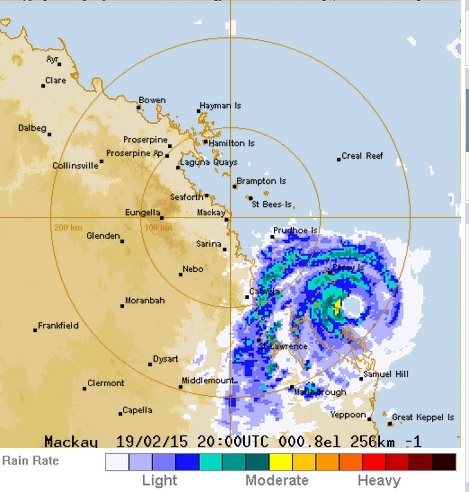 By 5.30pm it was near Creal Reef and about 175 km northeast of Mackay with a clearly visible eye on weather radar. The Tropical Cyclone Technical Bulletin reported it as having central pressure 958 hPa, 10 minute winds of 155 kmh and gusts to 220 kmh. By 10.22pm it had central pressure 940hPa, winds 195 kmh with gusts to 270 kmh, and had slowed to 7 kmh but heading southwest, straight for Mackay. By 3.20 am on Friday it was just to the east of the Percy Islands, where Middle Percy Island recorded winds from the south at 145 kmh gusting to 180 kmh. The maximum winds here were reached between 4.00 and 4.30 am when winds reached 156 kmh gusting to 208 kmh. Central pressure was 971.6 hPa. It is interesting to note that the apparent temperature was 1.3 degrees C- it is very cold in a cyclone if exposed to the wind. Strongest winds and heaviest rainfall are usually in the eyewall. Notice that the heaviest rain in the above image (yellow) is to the west of the eye- in the vicinity of Middle Percy Island. This is what made me strongly doubt the forecast strength. 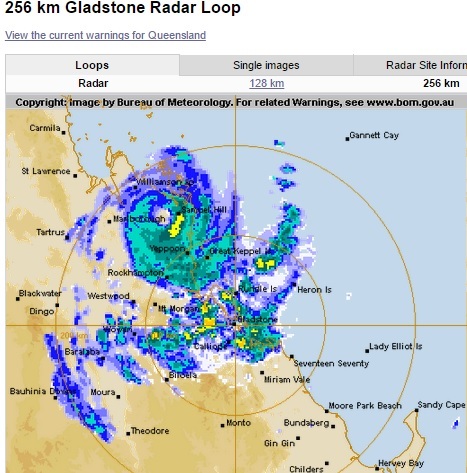 The Technical Bulletin reported it as having central pressure 929 hPa, winds 205 kmh gusting to 285 kmh, moving south at 13 kmh- straight towards Rockhampton. The next image is from 6.00 am, about two hours before landfall, travelling south at 30 kmh. Again note the heaviest rain outside and to the west of the eye wall. The eye is about 25 km across. Here is an interesting model of winds around Marcia when close to crossing the coast at 7.00 am on http://earth.nullschool.net/#current/wind/isobaric/1000hPa/orthographic=143.66,-20.38,1821. After this I was busily checking final preparations, having breakfast, and making and receiving phone calls, as well as watching the websites. By 10.00 am the wind was becoming much stronger, and the Bureau was still saying it was Cat 5 and heading straight for Rocky. Note the yellow area of heavy rain (and presumably strongest winds) south of Samuel Hill and close to Byfield. The wind strengthened and was at its strongest by about 12.30 pm, consistently from the east. There was one final prolonged gust, the strongest, at about 12.35 and then from about 12.50 the wind died away to nothing by 12.55 pm. Like many others I went outside and had a look around, but didn’t go far. It was raining lightly, heavily overcast, with puffs of wind from different directions. At 1.25 pm we could hear the wind coming, and it picked up again over about five minutes, blowing directly from the west, but didn’t reach the same strength as before. At a speed of 22 kmh, the eye was about 11 km across at this stage. This screenshot shows the eye right over us at about 1.10 pm. The eye is just visible, and strongest rain and winds are to the south and east. Note the eye has disappeared- it collapsed while over us. 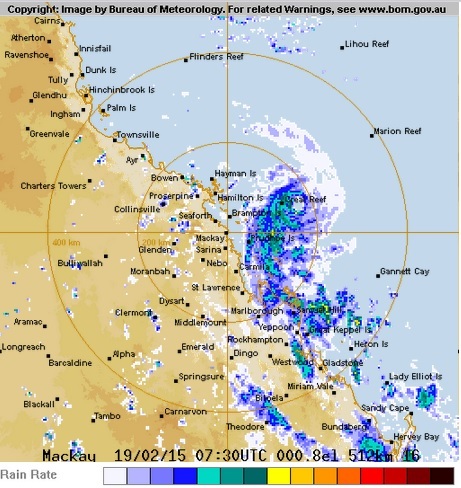 Rockhampton Airport is about 12km south-southwest, so 30 minutes later the eye should have reached there. But it didn’t. Here is a screenshot of observations at Rocky Aero from 12.41 to 4.30 pm. I have circled key information. At 12.50 pm the wind was ESE at 72 kmh, with a gust to 113 kmh. Between 1.13 and 1.52 (arrowed) the wind swung from SE to WSW, but never dropped below 24 kmh. Lowest pressure was 975.7 hPa. The wind steadily picked up and was strongest around 2.45 to 3.00 pm, reaching 82 kmh with a gust to 113 kmh. This was different from my experience, where the wind was consistently from the east, then very light and variable, then directly from the west, but not as a strong. The eye had collapsed before the centre was near the airport, and the remnants passed a couple of kilometres to the east. The cyclone was rapidly degrading. 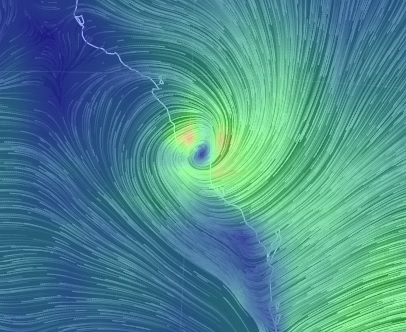 It shows Marcia still Cat 3 at 2.00 pm. But Rocky Aero data show winds were no more than Category 1 at this time. At our place, the winds at this time were from the west and still damaging trees but not nearly as strong as before the eye passed. By 3.00pm the winds were light and we were out in the street talking with the neighbours. On eastern slopes or hills, and closer to the coast, winds would have been much higher. I estimate gusts at our place, funnelled up a gully on an east facing slope, were around 120 – 130 kmh- similar to our experience of TC Ului at Sarina some years ago. 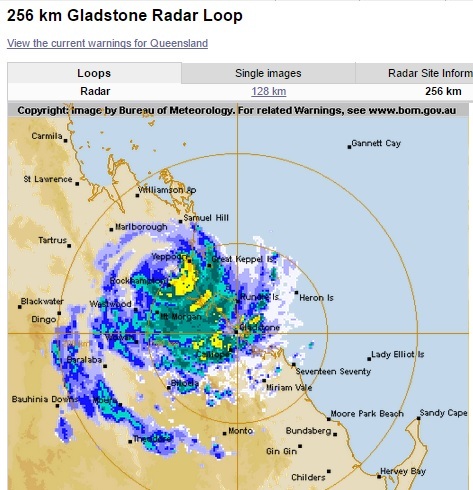 The Cyclone Testing Station of James Cook University has released a preliminary report at https://www.dropbox.com/s/9y8hdb74ycgemfi/TC%20Marcia%20Rapid%20Assessment%20Report%2020_02_2015.pdf?dl=0 . They will produce more definitive analysis in a few weeks. But was TC Marcia a Complex Cyclone, one in which maximum winds are concentrated away from the eye? All radar images show heaviest rain, and therefore probably winds, away from the eye wall. Byfield community is 30 km northwest of Yeppoon, half way between Yeppoon and Samuel Hill. There are reports of every tree stripped for kilometres, which appears to indicate strong Cat 3 to Cat 4 winds. Radar image at 10.10 am shows heaviest rain just to the west of Byfield and just to the south of Samuel Hill. Yet Samuel Hill did not experience winds of this strength. And here’s a photo of part of our block taken at 3.30 on the afternoon Marcia passed. Note every tree has at least 50% of its leaves stripped and several branches off, and several were completely uprooted, and these are tough old ironbarks. So allowing for 30 km closer to the sea and two hours earlier, I wouldn’t be surprised if winds were 150 – 160 kmh at Byfield- but not 200 kmh. Until JCU can do their complete assessment, we will not know exactly what happened. No doubt their engineers will also visit Stanage Bay, where Marcia crossed the coast. Tropical Cyclone Marcia was a very small, intense, and short lived Complex Cyclone, with maximum winds about 30 – 40 km away from the centre, and well outside the eye wall. At no time was it Category 5. 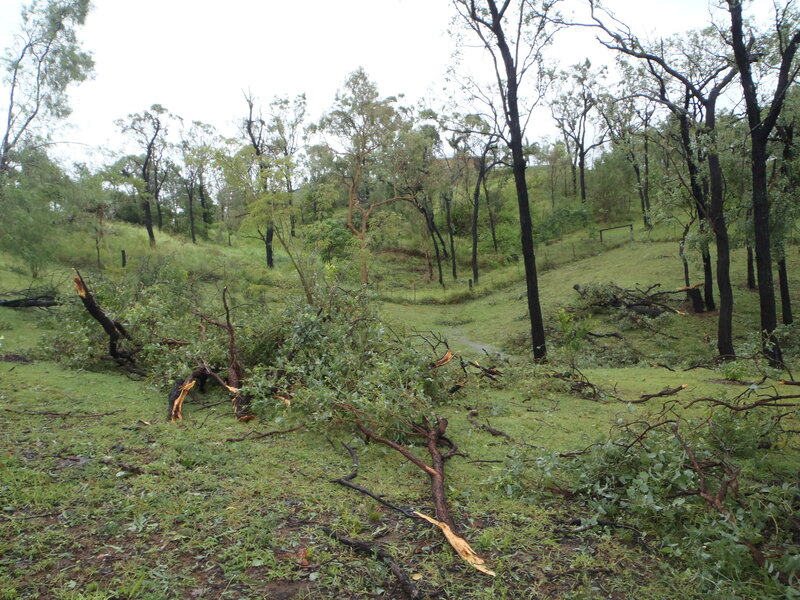 Despite its relative weakness compared to some other cyclones, Marcia did tremendous damage in Central Queensland. The main thing is no one was hurt. ……. 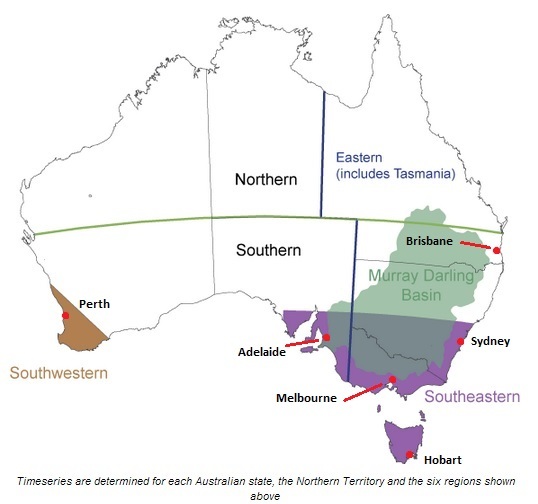 significant reduction in agricultural production in the Murray-Darling Basin and far south-eastern and south-western Australia if scenarios of severe drying are realised; more efficient water use, allocation and trading would increase the resilience of systems in the near term but cannot prevent significant reductions in agricultural production and severe consequences for ecosystems and some rural communities at the dry end of the projected changes. This pattern of projected rainfall change is reflected in annual average CMIP5 model results (Figure 25-1), but with important additional dimensions relating to seasonal changes and spread across models (seealso WGI Atlas, AI.70-71). Examples of the magnitude of projected annual change from 1990 to 2090 (percent model mean change +/- intermodel standard deviation) under RCP8.5 from CMIP5 are -20±13% in south-western Australia, -2±21% in the Murray Darling Basin, and -5±22% in southeast Queensland (Irving et al., 2012). Projected changes during winter and spring are more pronounced and/or consistent across models than the annual changes, e.g. drying in southwestern Australia (-32±11%, June to August), the Murray Darling Basin (-16±22%, June to August), and southeast Queensland (-15±26%, September to November), whereas there are increases of 15% or more in the west and south of the South Island of New Zealand (Irving et al., 2012). Downscaled CMIP3 model projections for New Zealand indicate a stronger drying pattern in the south-east of the South Island and eastern and northern regions of the North Island in winter and spring (Reisinger et al., 2010) than seen in the raw CMIP5 data; based on similar broader scale changes this pattern is expected to hold once CMIP5 data are also downscaled (Irving et al., 2012). As the Murray-Darling Basin (MDB) is the nation’s major food bowl, contributing a very large proportion of our agricultural production, a Reality Check on these claims is in order. 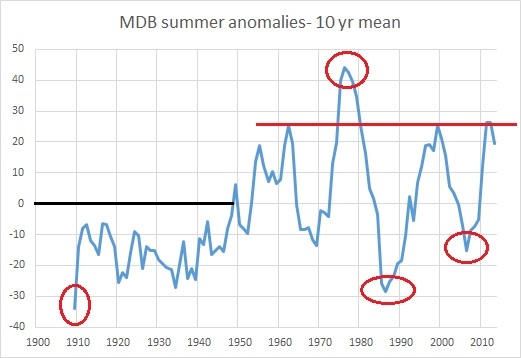 Note that for the entire period before the 1950s, the 10 year mean was below the 1961-1990 mean, and in 1946 was 94mm below. 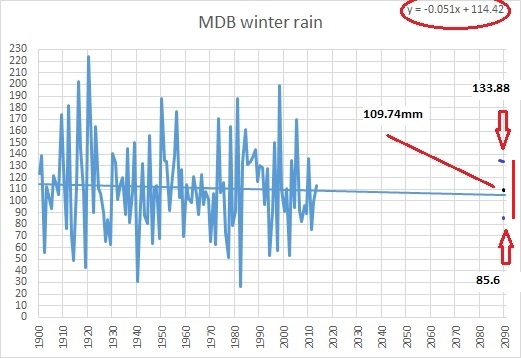 While in 2009 the 10 year average was 69mm below the mean, this being the first time in six decades it had been below -60mm, for most of the 1940s it was more than 60mm below the mean. 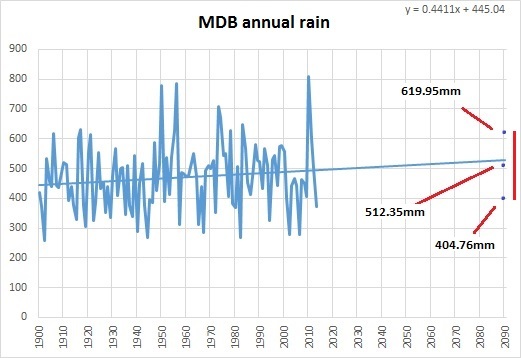 It is entirely possible that rainfall will be below average in the MDB for several more decades, and this would be completely normal. I shall now project this historical trend through to 2090, with a 2090 rainfall of 512.35mm, 2% below that of 1990 (522.81mm). So that’s what a decrease in rainfall looks like! 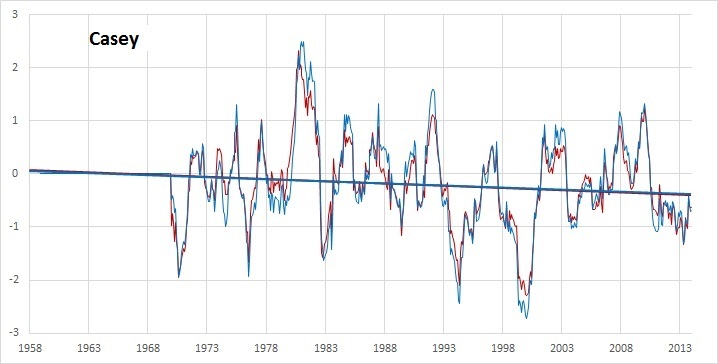 Note the uncertainty range- well within historical norms, and the low figure (404.76mm) is in the below average (lowest 30% of years) rainfall category by less than 4mm. 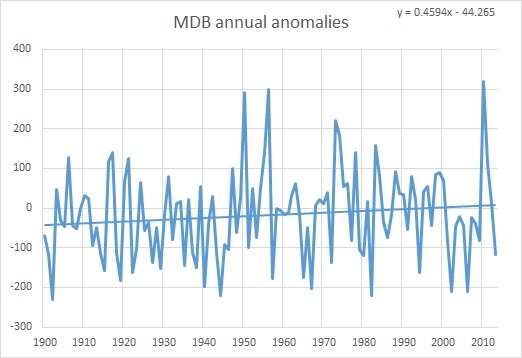 There you can see the declining trend (BOM says -0.57mm per decade)- but note the size of the trend compared with the variability. Interestingly, consider the same data for the last 54 years. But of course, the authors have detected the drying trend since the 1990s! 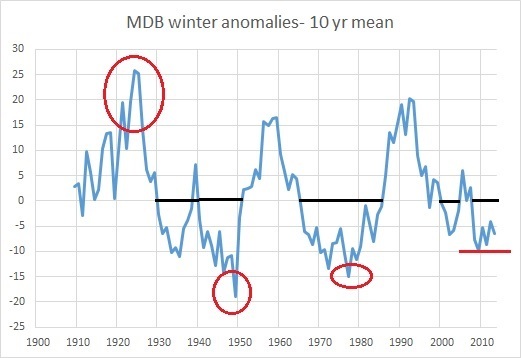 Note the 10 year mean about -10mm in past decade, but -15mm in the 1970s and -19mm in the 1940s. Note also that the 10 year average was below zero for the better part of two decades, twice, in the past. Below average winter rain for the next few years would be completely normal, if the past is anything to go by. 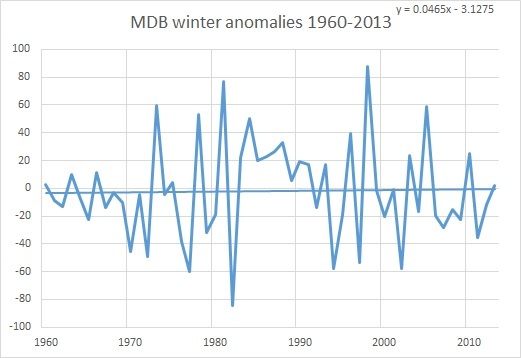 Here is a chart showing the number of dry winters per 10 year period in the MDB. 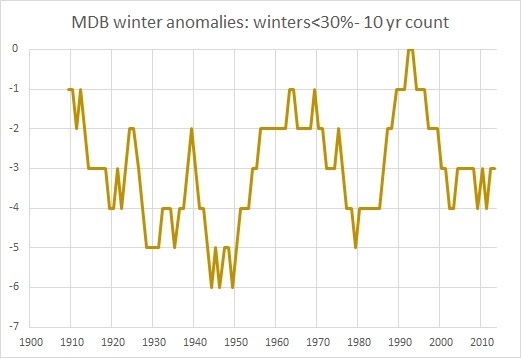 Fig.8: 10 year count of below average winters. Below average winters were more frequent in the past. 109.74mm is almost exactly the 1961-1990 mean (111.1mm). The low end of the uncertainties, 85.6mm, is in the below average range but well outside the severe deficiency or even serious deficiency level. Yet this will cause “significant reductions in agricultural production and severe consequences for ecosystems and some rural communities”? Note: these projections are based on continued warming by up to 2 degrees. 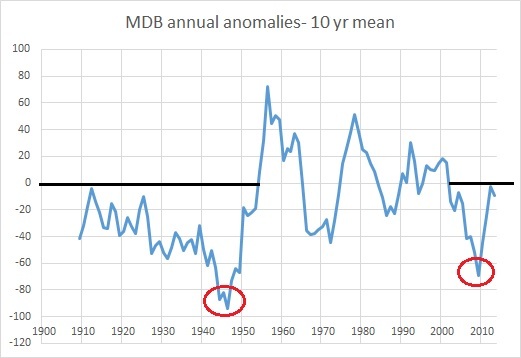 Consider that we have already seen warming in the MDB of about +0.8 C since 1910 (according to BOM analysis based on ACORN-SAT). It appears that the IPCC can’t be wrong, whether rainfall is higher, lower, or stays the same. They’re having two bob each way. In discussing agricultural production, I would have been less underwhelmed if rainfall in other seasons had been considered. If winter rain is down (marginally), but annual rain is up, when did it fall? Briefly, autumn, like winter, is almost flat (-0.59mm per decade), spring is up by 1.61mm per decade, but summer rain has increased 3.86mm per decade. If heavy rain falls before the wheat harvest is off, the crop is seriously downgraded, so late spring- early summer rainfall increasing would be of concern. 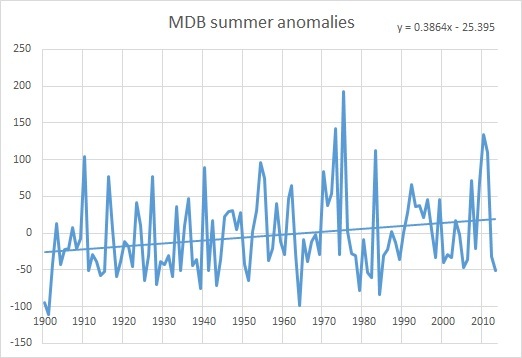 Note that summer rain increase is all since 1950. For 60 years farmers have been contending with this. It’s nothing new. Farmers adapt farming methods to changing conditions and with new technology. 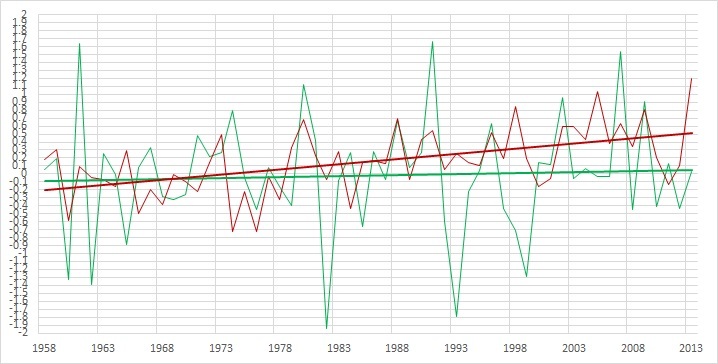 Moreover, the recent decadal peak is about the same as the 1960s and 1990s. Note also that the low decadal mean of the Millennium Drought is nowhere near the levels of past dry periods. The warming to now has ‘resulted’ in increased annual rain, made up mostly of stronger summer rains since 1950, and marginally less winter and autumn rain which is less variable than in the early decades of last century. The IPCC’s projections are thus the result of climate models and not historic observation, are subject to large uncertainty, and not greatly different from patterns of the past 114 years. The AR5 prediction of dire consequences for the Murray-Darling Basin, based on rainfall projections that are essentially no different from historical observations, is nonsense. It is beyond parody, beyond ridicule. It treats the citizens and farmers of Australia with contempt. What did Chris Turney expect? Professor Turney did not have to take an unsuitable ship full of “climate tourists” to Antarctica. He could have just checked the Bureau of Meteorology’s website. As the Aurora Australis will be calling at Casey base to deliver delayed supplies before returning the hapless Turney and the rest of the expedition to Australia, I thought I’d help with what conditions to expect at Casey. 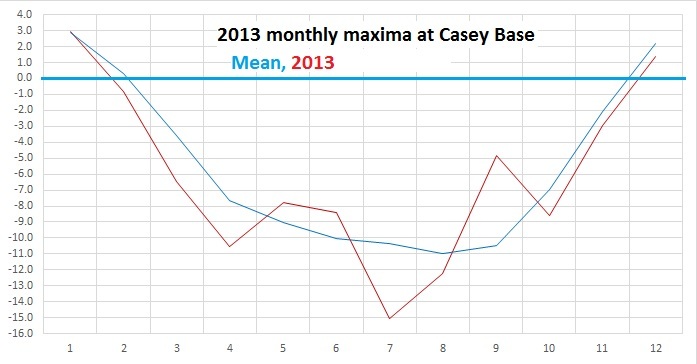 I used official ACORN-SAT monthly data to 2011 and Climate Data Online daily temperatures since then. And has there been recent warming? show a linear trend of about +0.15 C- but the rise (such as it is) is by no means steady. Remember, one of the so-called “fingerprints of greenhouse warming” is that warming should be greater towards the poles. Professor Turney could have saved himself a lot of time, trouble, and embarrassment. This is just a quick comment on the 2013 Annual Climate Statement released today by the Bureau. 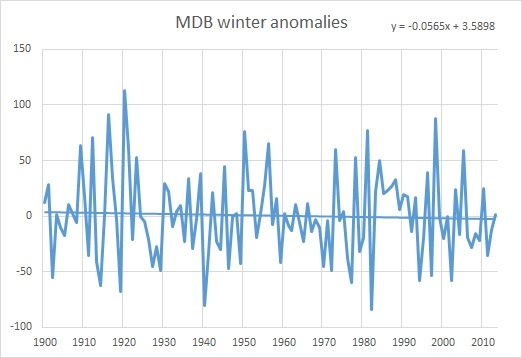 I have checked only minimum temperatures, and my calculation I released yesterday for the 2013 annual mean for minima was +0.82 C. The Bureau has reported an annual average of +0.94 C.
Note that all values in this statement are as compiled from data available on 2 January 2014. Subsequent quality control and the availability of additional data may result in minor changes to final values. What they really mean is that Acorn won’t be updated with 2013 data for several weeks, and that nearly all Acorn sites have many months of daily data that has not yet been quality controlled. This means that the values they give can not be checked for several weeks. As well, three Acorn sites in Western Australia ceased reporting in August 2012. Bridgetown has years of data that is out by two days, and Rutherglen has years of data out by one day. And on some 800 occasions the minimum temperature is higher than the maximum. Quality checking is not as rigorous as you might expect. Any changes may be only minor, but rushing to publish before the data can be checked is not a good look. This is the final post in my series of checking a hunch that temperature change indicates a weather change 160 days later. I did not change this in December. 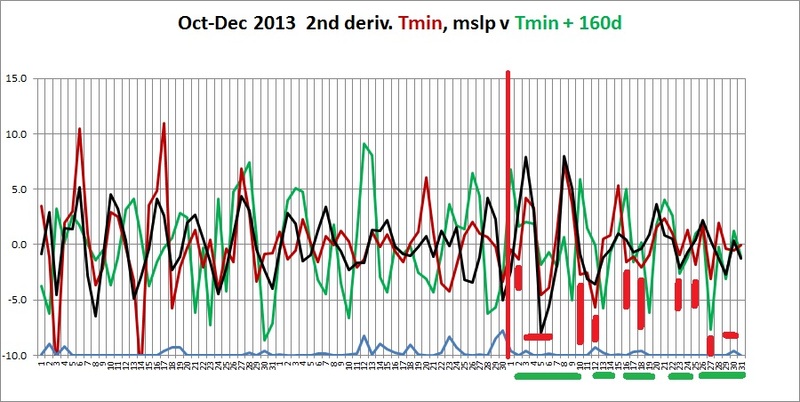 I’ve marked with green bars the predicted dates of unsettled weather as above. Red bars show the actual times. They match. And finally, here’s my graph showing predicted weather events for April to June. Again, green bars indicate dates when weather events may be expected. I will leave this topic for now, not because the method doesn’t work (it does! ), but to concentrate on other interests. All correct, 1 miss. Instability with some very wild storms marked much of November especially in the South-East of the state. 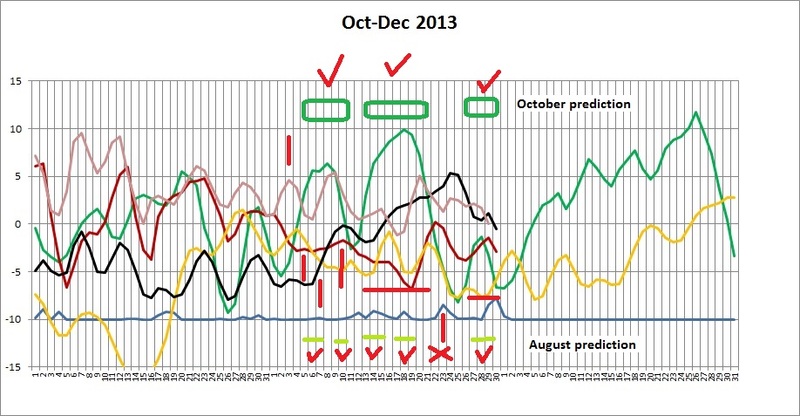 Here’s a chart showing August predictions in light green and early November predictions in dark green. 5 right, I miss. I should have stuck with my original predictions! So the method is holding. April should have unstable weather, and I would not be surprised if we get significant rain. You are currently browsing the archives for the weather forecasts category.